I’ve had lots of opportunity over the years to come to grips with MGs which stopped running when they shouldn’t, weren’t running well or at all, or which had a hole in need of patching. I’ll be writing about some of these experiences, and what I’ve learned and applied. I hope you find it helpful. One impressive fact about our MGs is our wealth of technical reference material written by devoted MG owners. It’s very hard to find a topic that hasn’t been touched on before, and there are many experts in the club on whom we can rely. Often, getting the answer to an MG technical question is largely about finding a knowledgeable person or article on the topic. My approach to technical issues follows that pattern. Last year, a friend asked me to improve the cold starting and running of his car. We took a test drive, and noted many shortcomings. The engine started after a lengthy coaxing, idled roughly when cold, accelerated with less than full power and idled too slowly when hot. At a hot idle, there was more valve clatter than one would find enjoyable, and one valve was particularly loud. After taking the typical tune up steps, I focused on the carburation issues including the operation of the choke. After the usual carburetor tuning, the engine continued to be very slow starting from cold, and would backfire through the carburetors when the throttle was quickly opened. The backfiring condition, a lean backfire, caused me to pause and reflect about what was taking place. Backfiring through a carburetor results from an ignition explosion occurring when an intake valve is not shut. Or it could possibly be fuel igniting in the intake manifold rather than the combustion chamber. I rechecked the ignition timing, found it correct, and decided this lean backfire was likely to be carburetor related. With a cold engine and the choke on full, why would the fuel mixture be lean? This seemed incongruous. I went back through the basic settings of SU carburetors without positive effect, and then concentrated effort on the operation of the jets. When the choke is pulled, the choke levers lower the jets to enrich the fuel mixture. Were the jets not fully opening when the choke was pulled, were the levers and jets operating consistently, or were the jets sticking or closing at varying levels? Operating the choke levers by hand revealed the jets appeared to be fully lowering, so why would fuel be lacking? I then rechecked the float levels because the level of fuel in the bowls corresponds to the fuel level in the carburetor. The float settings appeared correct. However, due to the difficulty I was having with cold starts on this engine, I wished to confirm the correctness of the fuel level and rule out this setting as a source of the lean fuel mixture. My research led me to good advice from Skip Burns and Dave Braun. Their articles, which helped me solve this issue, were available on the Web and links are provided below. Here are the steps I followed for correcting the fuel levels in these carburetors. They apply to all MGTs. 1. 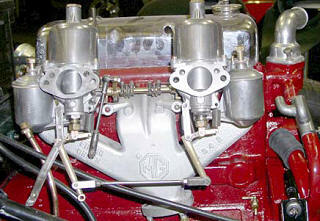 The float levels should be set according to the standard SU carburetor instructions. 3. Remove the dampers and pistons from the carburetors. Both must be removed because the fuel level in each carburetor must be checked independently. 4. Select a carburetor and look directly down into the carburetor body at the point where the needle is inserted into the jet. While doing so, grasp the choke lever from below and move the jet up and down, observing the jet rising and lowering within the jet bearing. 5. When the jet is fully lowered, you should see fuel within the jet bearing above the top of the jet. Perhaps you will see the fuel level is high and near the top of the jet bridge, perhaps it is barely covering the jet, or perhaps you cannot see the fuel. Check the other carburetor and most likely, you will find a fuel level varying from the other carburetor. 6. Reset the float bowl levers as needed to equalize the fuel levels above the heads of the jets when the jets are at their lowest point. This can be done by eye alone or measured by using a small screwdriver or slide caliper. Any fuel level above the head of the jet is satisfactory according to Skip and ideally will be 3/8 inch below the jet bridge. Also, I have been setting the fuel levels equal to the carburetor with the highest fuel level. After an adjustment, put the lid back on the float bowl, and switch on the ignition to activate the fuel pump and fill the float bowls. Recheck and readjust the float levels until you are satisfied. 7. Reset the fuel mixture of the carburetors. I’ve had success with this procedure on four MGs now including a TF, TD, and TC. You can expect your MG will start faster, particularly in cold weather, and idle more evenly after equalizing the fuel levels within the carburetors.